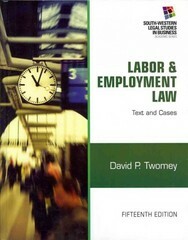 Labor and Employment Law 15 Edition LABOR AND EMPLOYMENT LAW: TEXT & CASES, 15TH EDITION, written by a nationally renowned White House labor arbitrator, offers comprehensive and objective coverage of labor and employment law topics that challenge readers to develop critical thinking skills through case analysis. In-depth chapters explore labor law topics, focusing primarily on the National Labor Relations Act, and are updated to include coverage of court systems and the role of administrative agencies in policymaking. Understand the majority views, the dissenting opinions, and the current laws that apply to these areas and follow the continued controversy over topics like discrimination law (including race discrimination, religious discrimination, national origin discrimination, age discrimination, sexual harassment, etc.) as well as worker's compensation and employee privacy (updated to include text messaging issues).